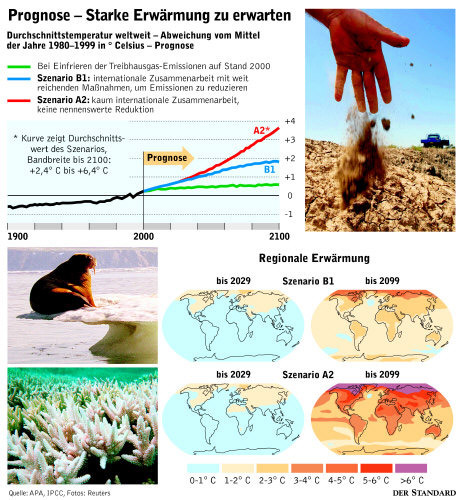 Climate Change 2007: The Physical Science Basis, assesses the current scientific knowledge of the natural and human drivers of climate change, observed changes in climate, the ability of science to attribute changes to different causes, and projections for future climate change. IPCC Fourth Assessment Report, Working Group III Report "Mitigation of Climate Change"
IPCC Fourth Assessment Report, Working Group III, "Mitigation of Climate Change"
IPCC Fourth Assessment Report, Working Group II Report "Impacts, Adaptation and Vulnerability"
II of the Intergovernmental Panel on Climate Change (IPCC). The Assessment is of current scientific understanding of impacts of climate change on natural, managed and human systems, the capacity of these systems to adapt and their vulnerability1. It builds upon past IPCC assessments and incorporates new knowledge gained since the Third Assessment. IPCC Report: Climate Change 2007, Working Group I Report: "The Physical Science Basis"
Highlights from "Climate Change 2007: The Physical Science Basis - Summary for Policy Makers"
The White House yesterday embraced a new international report faulting humans for global warming, marking the furthest President Bush has gone in placing blame. But administration officials again rejected the Kyoto-style caps on carbon emissions that have been the preferred solution of European nations. The report, released in Paris by the U.N. Intergovernmental Panel on Climate Change, said the fact that the Earth is now warming "is unequivocal," and said it is "very likely" that human activity is responsible for many of the changes. After years of research and a marathon week of intense secret debate, scientists from around the world last night signed off on a bleak assessment of a devastated planet: Earth. A turbulent future of violent storms, devastating drought, increasing temperatures and rising sea levels is inevitable, according to a United Nations report released in Paris last night. The report, the work of 2500 scientists over six years, is considered the most authoritative evaluation of climate change ever produced. The first volume of the fourth assessment report by the Intergovernmental Panel on Climate Change (IPCC) has been almost three years in the writing and brings together the work of 600 writers from 40 countries. More than 620 experts have reviewed the findings, and representatives of 113 governments have read and revised the key points. The report assesses our current knowledge of climate change and the reasons behind it, looks at how the climate has already changed and how a range of different scenarios may have an impact in the future. Die US-Regierung hat sich in einer Reaktion auf den neuen UNO-Bericht über die Erderwärmung gegen einseitige Maßnahmen zur Bekämpfung des Klimawandels ausgesprochen. Der US-Anteil am Ausstoß von Treibhausgasen sei nur "gering, wenn man sich den Rest der Welt ansieht", sagte US-Energieminister Sam Bodman am Freitag.